Ken, as he was known, was brought up in Reading and after National Service in the RAF worked in atomic energy research at Harwell and Aldermaston. cricketing days were over croquet could be a game which he and Margaret could play together. Ken had been a keen sportsman at school and afterwards he became an accomplished cricketer playing both at Reading and Maidenhead. He eventually performed in nearly all the Gilbert and Sullivan operas and for some years was chairman of Reading Amateur Operatic Society. Ken and Margaret quickly immersed themselves into croquet with help from fellow Harwell members, Mike Duck, Mike Moreton-Smith and Terry Wood. After their first weekend tournament at Bowdon, Ken (who had learned the art of using bisques) came back with a handicap of 10. Ken and Margaret became frequent players at weekend tournaments and were once members of both Cheltenham and Nottingham clubs. and became an examining referee. In 1984 Ken and Margaret joined the growing Croquet Section at Phyllis Court Club. In 1991 when Ken retired they were able to join the committee of which in due course Ken became chairman for two years. players to learn a little about association croquet. They also bought a cabin cruiser which was moored at Phyllis Court and went on extensive cruises of the English river and canal systems. This activity tended, they said, to clash with the croquet season. They took up golf croquet as well and enjoyed its challenges. Ken had been a bell ringer from an early age and he and Margaret were active church members at Didcot where they lived. 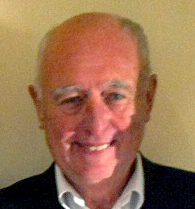 Ken served as treasurer and later churchwarden. He was also a member of the Deanery and Diocesan Synods and became deanery treasurer and served on the Oxford Diocesan Buildings Committee. Court and was particularly keen to see players trying out both forms of the game. Following a protracted illness Ken died on 29th August. His funeral at All Saints, Didcot, was well-supported by his croquet and other friends. 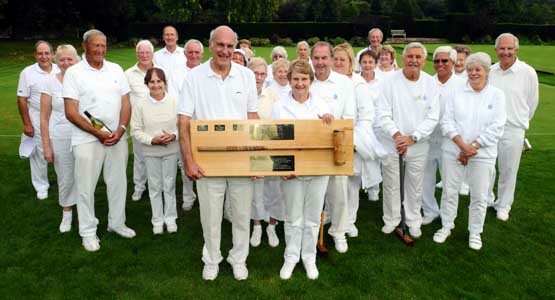 As you read this PCC 'B' will be trying to go one better than last season and win the Southern Croquet Federation's Handicap League Final. Having won the Northern Division for the second year in a row (PCC 'C' were a close second), out team again face Southern winners Hamptworth from the New Forest. PCC 'B' field a strong line-up with the in-form Ian Norris and Mike Fensome augmented by Raymond Wood and Pam Mead and should start as favorites, but in handiacp play, anything can happen. 17th September - IT's ALL HAPPENING! In only his second season of croquet, Ian Norris has shot to prominence both at Phyllis Court and beyond. 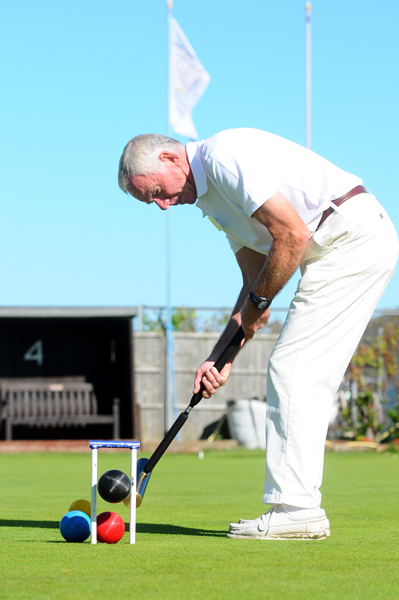 As well as winning three qualifying events in the Golf Croquet National B-Level Series, and there by booking his place in the National Final in October, Norris has a previous engagement on the natuonal stage this weekend. Under the watchful eye of fellow PCC members Chris Roberts and Frances Colman who are the National Director and Finals manager respectivly, Norris will compete in the Final of the All England Handicap Competition at Hunstanton on the Norfolk coast. Don Rutherford and Ralph Chambers enjoyed thier time at the National Centre Stage Finals (for handicaps 5+) last weekend, so PCC are really on the National map. 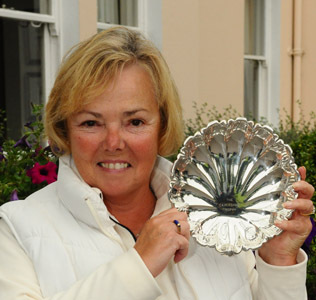 The Caversham Plate for the senior section of the PCC Autumn AC Tournament was won for the first time at the weekend by Frances Colman who played beautifully throughout. She was undefeated in her four games and constucted long breaks in each to build on her successful season. Ray Broardhead won the high handicappers event and so took home the Zia Sterling Cup. Twenty-eight mainly higher hanicappers contested the last of the season's three drawn partners tournaments on Thursday but only one pair were undefeated at the end of a long day. Playing to the unfamilier Swiss format, he eventuall winners had not only won all thier games but seen off all of their nearest rivals too, so Christine Searle and Colin Morgan were very worthy winners indeed. 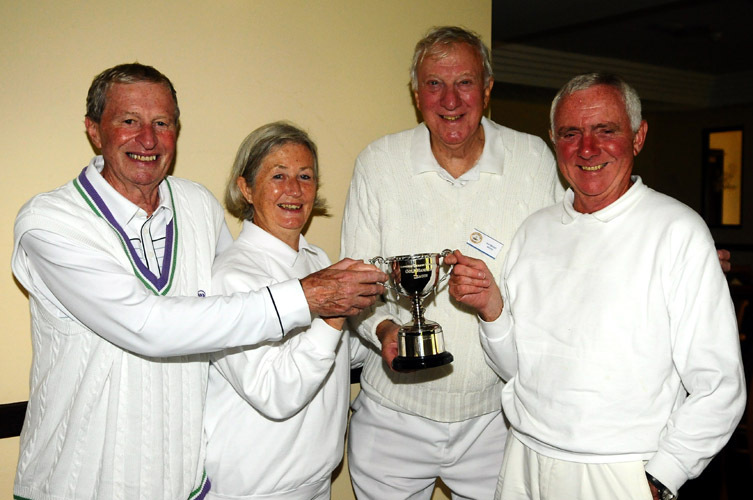 Our 'B' team beat Hamptworth last week in the final of the Southern Federation GC Handicap League, thereby gaining revenge for their last hurdle loss in 2012. The impressive 5-2 score-line was all the more so, as their opponents had the home advantage on their fast closely cropped courts. However is was our side that had the greater experience in truth and the dividends of having played in on such good surfaces in outside tournaments really did shine through. The doubles rubber was won easily enough by Captain Raymond Wood and Pam Mead, while Ian Norris was taken to a third game to decide his morning singles. Hamptworth's only success before lunch was down to the canny play of Nick Beard who had too many extra turns for our Mike Fensome to cope with. 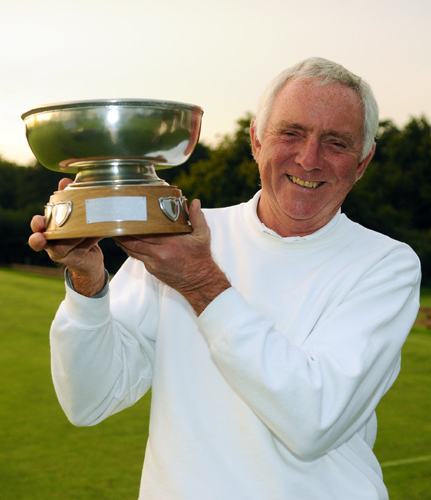 Norris, Mead and Fensome wrapped up victory with singles wins in the afternoon and only Wood was disappointed not to have won his close encounter with the experienced Richard Jenkins. PCC 'B' 2013: Raymond Wood (captain, 5 games), Mike Fensome (5), John Chalfont (4), Michael Wiles (4), Pam Mead (3), Ian Norris (2), Helena Fensome (1). Ian Norris continued his great season with a fabulious 5th place in this National event at the weekend. After dropping his tough first game to the eventual winner, Peter Balchin from South Wales, Norris blazed a trail and was always up with the leaders. The changing conditions on the Hunstanton (on the Norfolk coast) raged from fog to glorious sunshine. Some good quality play and, as one of the lower handicapped players in the field, some inventive extra turn work was on show from Norris in front event Manager Frances Colman and Director Chris Roberts. This is real feather in Norris' cap and he will be looking for an even better result next month when he returns to Hamptworth for the final of the National B-level Series. Chris Roberts and Mike Fensome will contest the title Friday afternoon at about 1600 and it should be a good one for spectators! Additionally we have had many single day tournaments through the season and the winners have been communicated to you all as we went along, via e-mail and/or In Touch. See them all via the buttons 'Golf Croquet' or 'Assoc.Croquet' buttons on the left. Ian Norris is NATIONAL Golf Croquet B-Level Champion! We have a national Champion at our Club for the first time! Ian won the finals tournament of the National B-Level Series last weekend at Hamptworth to become the inagral winner of this event. He only had one reverse in all has games and qualified with ease for the semi-finals on the super courts of the Hamptworth Club in the New Forest. 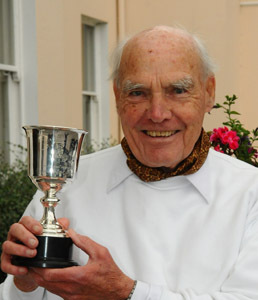 He defeated John Small Bone of Watford for a place in the final against the host club's David Cooper who was the only one to beat him in the block games. Our man made a steady start and traded hoops with the local how was clearing exceptionally well time and again from distance. A perfect jump shot drew applause from Croquet Association Chairman and international player Jeff Dawson along with Frances Colman and Chris Roberts who were managing the event. It looked however that Norris had blown it when he lost the 11th after a poor approach and a hoop later he was facing defeat going second to the last hoop. Frances Colman is the new AC Champion of Greece! 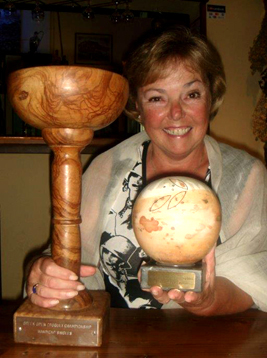 Frances was undefeated run of six tournament games in Corfu last week to lift the unique olive wood trophy. She won four full games in the handicap tournament and backed those up with two more in safeguard consolation half-game event, that ultimately she didn't have to fall back upon. Frances beat Liz Taylor-Webb in a final that got close near the end but that she never looked like losing as she played her cool and calculated game. Although the courts were 'tricky' to say the least, in winning six games on the trot, she took her unbeaten run in all games into double figures, reduced her handicap down a mark to 8 and is now knocking on the door of 7. 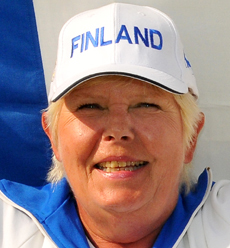 Frances co-managed the tournament and associated holiday with Chris Roberts and the latter's previous successes in 2011 and 12 mean that Phyllis Court have won the Greek title for three years in a row, which is half of it's history. Frances is no stranger to playing abroad and will be jetting off the South Africa twice this winter and along with Roberts will contest the former Western Province event at Kelvin Grove in February. Harry Midgley today took over as the new Chairman of Phyllis Court Croquet Club at the first committee meeting since our sucessfull AGM and prizegiving dinner on Friday. Having served on the committee for that past year as the 'courts and equipment' officer, Harry is well placed to lead our Club forward next season and I'm sure that we all wish him the best of luck and will give him our full support. At this evening's AGM, out going Chairman Chris Roberts was delighted to at last announce that WINTER PLAY will be available at Phyllis Court from January. This is just the headline news as the finer details of this decision will be worked out by the new committee that takes us forward to the 2014 season.